MANILA - Sporting a white shirt that bears his name in red, senatorial candidate Neri Colmenares walked on stage as his signature "Call Me" campaign jingle blared in the hallway, muffled by the applause of laborers clad in red and white. The event, mounted by supporters from the Makabayan bloc at the Quezon City Sports Complex, was for the announcement of two more senatorial bets they would endorse for the May 13 midterm elections. And Colmenares, among the first batch of bets that received the group's backing, was among the key guests, taking one of three reserved seats onstage. 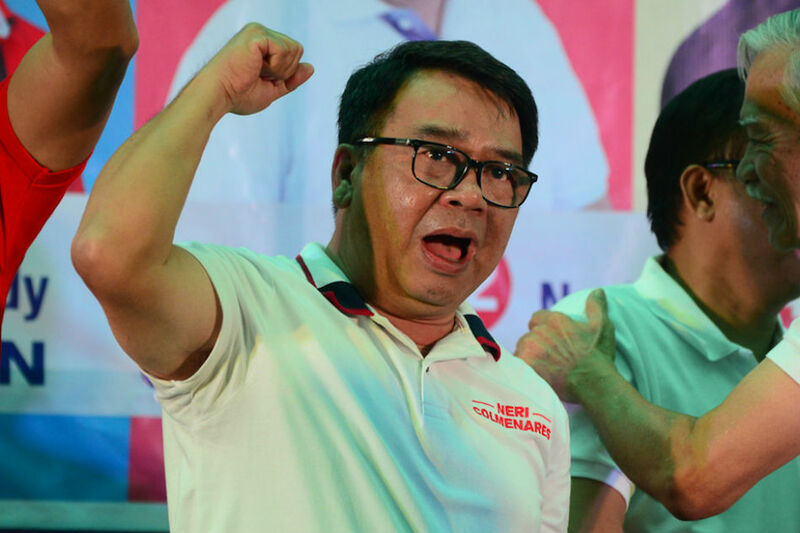 Colmenares is in the heat of his second attempt at the Senate, following the line of long-time activists and former left-leaning sectoral representatives taking a shot at the chamber. His colleague in Bayan Muna, former Rep. Satur Ocampo, failed in 2010. So did Gabriela's Liza Maza in the same election year. In 2013, Teddy Casiño did not make it. And Colmenares was out of the winning roster of 12 in 2016. 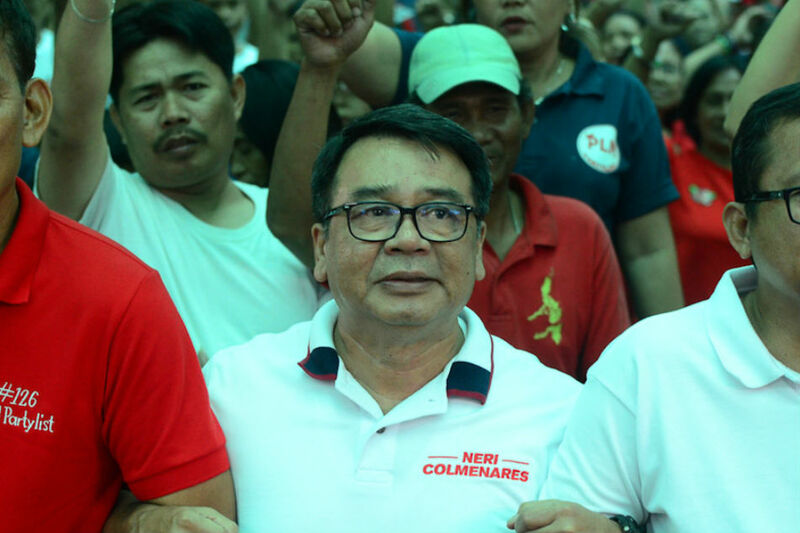 For Colmenares, it's a matter of principle - one he has carried throughout his campaign, protesting and bringing up key issues instead of the familiar song-and-dance tack. He said his slogan "Call Me" mirrors what he wants to happen in the Senate: for people to approach him should they feel their rights were being repressed, a principle he has championed as a lawyer and a youth activist. For Colmenares, principle is all in a day’s work, a facet which he thinks voters should take note of in the coming elections. “Matagal ko na iyang pinaglalaban so that’s my advantage there. Neri Colmenares, paglalaban ang mga masa, paglalaban ang mga senior citizens, may eleksiyon man o walang eleksiyon so that’s something na dapat tingnan ng mga botante,” he told ABS-CBN News on the sidelines of the March 14 event. Born in 1959, Colmenares studied at the San Beda College for his undergraduate degree and took up law at the University of the Philippines, eventually passing the Bar Exams and since then building a reputation as a human rights lawyer. He has served as counsel in high-profile cases, notably a petition to nullify joint exploration in the West Philippine Sea. First as a lawyer and then as Bayan Muna representative, Colmenares also fought for reparations for victims of the late strongman Ferdinand Marcos' dictatorship and pushed for laws criminalizing torture and enforced disappearances, having himself experienced - and survived- that dark chapter in Philippine history. An active member of activist groups such as the Student Christian Movement of the Philippines and the College Editor’s Guild of the Philippines during martial law, Colmenares was in and out of prison where he was tortured by the Philippine Constabulary. Decades later, as sectoral lawmaker, he passed laws mandating reparation for human rights victims during martial law, the anti-torture law, and the anti-enforced or involuntary disappearance act, among others. While several laws already exist to protect human rights, the former solon believes that ending oppression is far from over. Colmenares cited what he described as "anti-poor policies" of the Duterte administration, something he would bank on as he wages a bid for the Senate as an independent. “Ang pinaka-iba ngayon, ang mga issues ay iba ngayon at iba na rin ngayon ang tinatanong ng mga botante (What's really different now is that the issues are different and voters are asking different questions)… at 'yun ang advantage naming mga (and that's our advantage as) independents: we can talk directly to the people against the TRAIN law… we’re against these policies cowing to China on the West Philippine Sea,” Colmenares said. He was referring to the Tax Reform for Acceleration and Inclusion law, considered a factor in the increase in prices of basic goods starting in 2018. Ocampo agreed with Colmenares, saying things were different from when he was running for the Senate 9 years ago. "Ngayon, ang pinakamatindi ay iyung patuloy na pagtindi ng political repression. Lahat na lang ng kritikal sa gobyerno, kinakalaban ng presidente at sa mga matataas... Kaya lahat ay nagwo-worry," Ocampo explained. For a political analyst, limiting the ground campaign to only one constituency has done left-leaning groups more harm than good in the past few years. For Colmenares to win, Casiple said the former solon has to woo people from the middle class. “There is an inherent a problem that the Left usually only appeals to their own... You have to break that. Meaning those in the political middle field have to be convinced, so that is a very uphill battle,” Casiple said in a phone interview with ABS-CBN News. Since the 2010 elections, the Makabayan bloc has been fielding one or two candidates in the senatorial polls, but victory has been elusive. Even with famous left personalities running in the 1987 senatorial polls, Partido ng Bayan, the precursor to Bayan Muna, failed to secure seats in the Senate and only got 2.3 percent of votes in the elections. In 2010, former Gabriela party-list Rep. Maza finished 25th, with some 10 percent of the votes. Ocampo, who was Bayan Muna sectoral representative, finished a notch lower with 9.28 percent of votes. Casiño, also formerly Bayan Muna lawmaker, finished 22nd with 10.70 percent of votes in the 2013 polls, while Colmenares finished 20th in 2016 with 14.48 percent. As to his chances this election year, a recent Pulse Asia survey showed Colmenares breaking through the top 19-24 bracket. While still far from the winning roster, Colmenares took it positively. "This means that our hard work paid off and I thank the members of Makabayan for this. The survey also proves the failure of the PNP’s (Philippine National Police) and AFP’s (Armed Forces of the Philippines) black propaganda against me and the Makabayan bloc because more people prefer to look at my track record as a fiscalizer and author of pro-people bills," Colmenares said in a statement. While Casiple has “high praises” for the coalition’s advocacies, he said negative campaigning against the administration could have an effect on their vote. He added that while it may be an advantage that Colmenares is doing better in recent surveys on senatorial preferences, voters still favor familiar candidates. Casiple also cited the “huge personalities” that Colmenares has to compete with, such as administration-backed Christopher "Bong" Go, President Rodrigo Duterte's close aide, former police and corrections chief Ronald "Bato" Dela Rosa, and former presidential adviser on political affairs Francis Tolentino. All three were in the winning bracket in the latest Pulse Asia survey. Colmenares was in the 22-24 range. 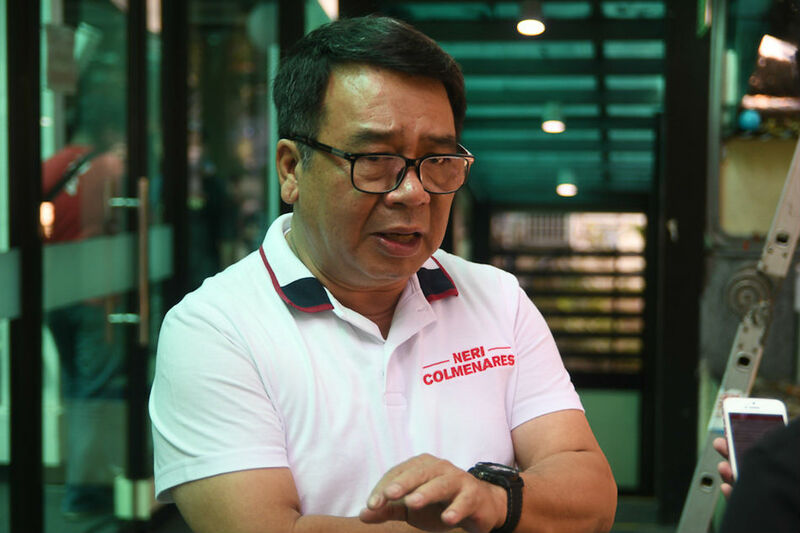 Although Colmenares may have higher reach in social media compared to other candidates, Casiple said this may not be enough to trump the impact of mainstream media, such as political ads on radio and television, on voters. Colmenares admitted that budget constraints have been an obstacle. “Advertising is really expensive. ‘Pag sinabi mo na ikaw ay hindi pa… sinabi mo eh whereas ako hindi nila maririnig ang message ko (If you say you have not... They (voters) have not heard my message). If I’m only given the money to advertise I think it would be easy for me,” he said. Nonetheless, Colmenares has his head up high as he marches onward in his campaign, steadfast in his mission to "protect the public from further oppression."